Jen's work, while appearing on the surface to be incredibly gentle, is, in fact, powerful beyond words, and transformational at the very deepest levels. I can literally feel the "en-lightening" of my being during each of our sessions, as well as an irrepressible opening to the essence of who and what I really am. Welcome to Brigid’s Way, inspired by the Celtic goddess of healing. It’s time to reclaim, cherish and actualize the full wisdom of the Plant Kingdom, much of which has been lost over the millennia. Plants are the guiding force behind our work. We intimately connect with the complex healing intelligence of Plants, Flowers and Nature Spirits through our Essences, private consultations, “singing plant” music technology, classes and more. Our goal is to help you gain deeper insight into yourself and the world around you. Brigid's Way can gently assist you in returning Home to yourself and being all that you can be. Brigid (453 to 524 AD) is one of Ireland’s patron saints and a Celtic goddess known as the Goddess of the Flame and Goddess of the Well. Brigid embodies many of the aspects that we wish to evoke in our work, so we are honored to follow her path. For more than a millennium, she has been revered for her compassion. At Brigid’s Way, Love and compassion are the guiding principles of everything we do—for others, for all sentient Beings, and most importantly, for ourselves. Brigid taught how to harvest and use herbs for healing. At Brigid’s Way, we focus on healing and teaching others how to heal themselves, particularly through the wisdom of Plants, Flowers and Nature. To this day, many wells with sacred water throughout Ireland and the British Isles remain connected to Brigid. Visitors travel worldwide to these wells in search of healing. 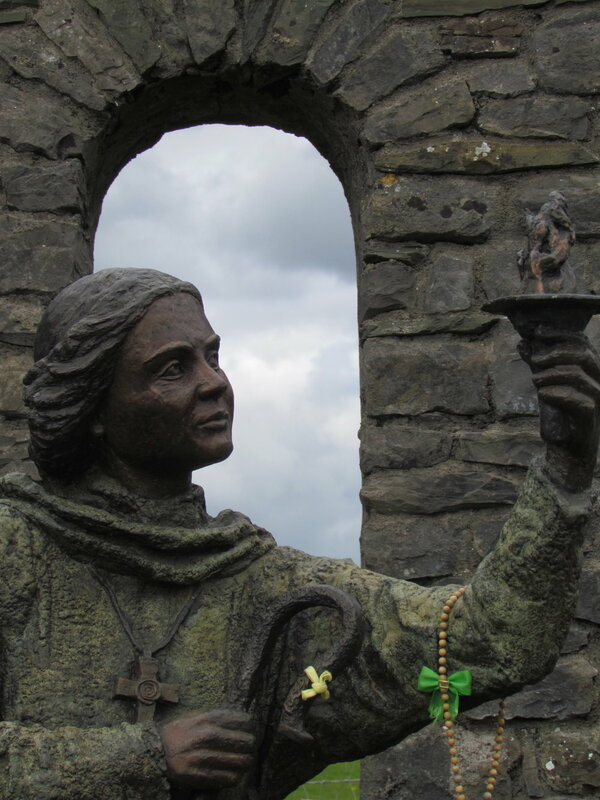 In fact, Brigid’s Way offers an Essence from the Brigid’s Well in Liscannor, Ireland, which gives clarity about the core issue and assists in ancestral and karmic healing. Associated with renewal, rebirth and fertility. Brigid’s holy day is February 1, called Imbolc or Candlemas. This auspicious day is the halfway point between the Winter Solstice and Spring Equinox. It is said that on this day, the seeds and bulbs that have been dormant underground begin to stir. Goddess of Peace and Unity. Now more than ever, these two aspects are necessary for our evolution. Survival of the fittest is no longer appropriate (not that it ever was), and we now need to focus on collaboration and adaptability. Protective Goddess of Force. She is a mother, protecting her children and her home. Known for her enormous concern for the development of Human Potential. Brigid knows that we are capable of being more than we currently are, and can help us find our True Essential Nature. A bridge between worlds, from Ancient to Modern times. She can help us incorporate the best aspects of both to create a better world. Brigid’s Way is a partner organization for the Organization of Nature Evolutionaries.